The King is Dead* is an abstract strategy game for two to four players designed by Peer Sylvester, which essentially reimplements his classic 2007 design ‘King of Siam’. The game has beautiful style, quality and art throughout, from the bookshelf-style box to the map and cards (although the bog-standard wooden cubes are a let down, largely because of how nice everything else is). You get 40 plastic finish cards, 63 wooden cubes, 32 cardboard tokens, a board and the rule book. The box is hugely oversized for what you get in it, but the £20 price tag is fair. 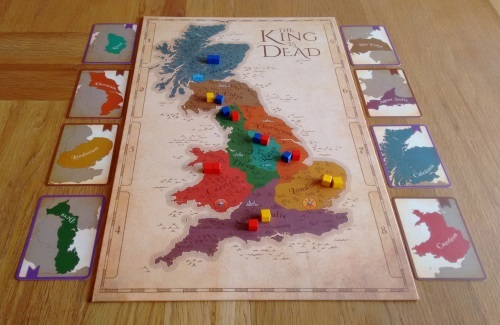 Set in Britain at the time of King Arthur, this is an area majority game where players are the power behind the throne. To claim victory you will need to back the winner, influencing the outcome of eight key regional battle fought over the game’s eight turns. It plays in well under an hour and is for two to four players, though feelings vary on the preferred player count (see ‘observations’ below). The King is Dead is a very simple game to teach, as every player has the same set of eight action cards available to them for each game. The majority of these cards simply allow you to place or move influence cubes on the board, so it literally takes a few minutes to get up and running. The board, a map of Britain, is broken up into eight areas – each of which is seeded with a couple of cubes during setup. These represent the competing armies of England, Scotland and Wales, each of which has a set stronghold (Wales, Scotland and London) which is always seeded with their colour. The other areas are seeded randomly. Each region also has a card. These are shuffled and laid out randomly at the start of the game to show the order in which conflicts in these regions will be resolved. Along with the random army setup, this ensures every game will be a different challenge despite the seemingly small number of moving parts. The real genius of the game lies in one clever mechanism. Once the board has been seeded with armies, each player takes two random cubes from those remaining: their starting influence. When the eight regions have been decided, you want to have the most total influence of the army that won most battles – and consequently crowns the new king. This sounds simple enough, as each time time you play one of your action cards you also get to take an influence cube of your choice into your personal stock of influence. However, the cube you take has to come from the board – meaning you are weakening the country you want to back in terms of board position. This works fantastically well and can lead to some agonising, and really clever, extra levels of tactics and strategy. Another interesting aspect of play is that their are eight rounds to the game and each player has eight action cards – but the two numbers don’t correlate: you’re under no obligation to play one action per round. You will of course want to play all eight cards, as each will give you a precious influence cube. But a round only ends when all players pass, rather than play an action, and you can find yourself wanting to go all-in to win a territory – but if you go too big too early, how will you influence the late game? One final thing you need to get across when teaching are the various end game scenarios that may crop up. In a game with three countries vying for just eight areas, and with players only getting a maximum of 10 influence points across those countries, there is plenty of room for draws – and therefore tie-breakers. The writer: An extra added wrinkle is the possibility of a Saxon invasion. 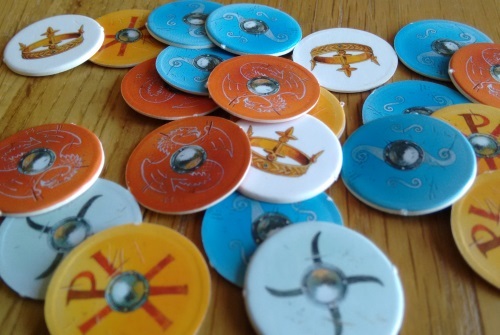 If two or more nations draw an area, none of them take it and you instead put one of four Saxon tokens on the region. If the Saxons win four regions, the game ends immediately. Instead of winning by backing the right country, you instead form the resistance – so win by having the most sets of cubes (so equal numbers of the thee countries here is key). While this sounds interesting, I’m yet to see anyone win with the tactic and can’t help thinking it will only really be possible if two players go for it. The thinker: This is a magnificent game, with a lovely blend of tactics and strategy within its short play time. One of my favourite strategic aspects are ‘partial actions’; where you get to play a card, but due to board position you cannot do the whole action – but do still get to keep a cube. 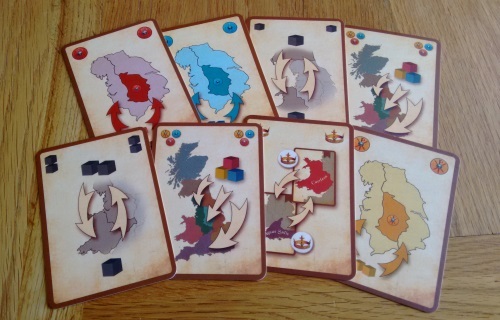 This can be particularly powerful late in the game, when you may be holding a card that will add two influence to a region you do not back – but that country has control of no areas you can legally place next to, meaning you don’t have to put the influence on the board. This kind of subtlety keeps on emerging from the game the more you play it. The trasher: The King is Dead is tight, smart and fast, but I find it very difficult to balance the use of actions through the game. If you’re a tactical player its hard not to get set on a region and become determined to win it – wasting cards in the process. It’s particularly tough if two of you get entrenched in a three-player game, leaving your other opponent with loads more cards than the pair of you; making it much easier to control the board (although in a three-player game the player who has the last action card in-hand can only play it if it can actually win them the game). A good game, but one I find extremely frustrating. The dabbler: Really clever, and beautiful, but too dry and abstracted for me. It’s the kind of game that kills conversation rather than creating it, as everyone sinks deep into thought. That said, it is possible to win by kicking back and seeing what happens for the first half of the game and then going with the flow, never having a single strategic thought! But for me I’d rather put the kettle on, top up the wine or grab another bag of nibbles and wait for something a bit more fun to come along! If you’ve skipped here because you’re familiar with King of Siam and are wondering if there are significant differences, fear not – the games are very close. 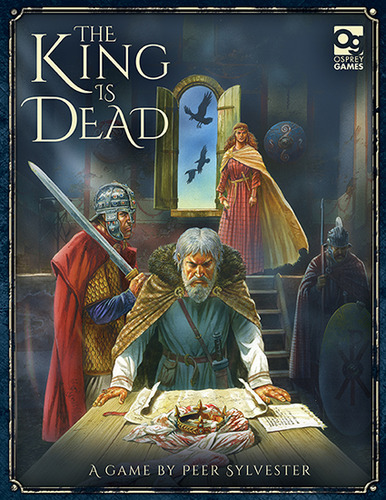 I feel The King is Dead loses nothing in translation; the publisher worked closely with the original designer on the new map, ensuring the same level of interaction. Some King of Siam players have expressed concern about the random pick of starting cubes for players (in the original game, you have set followers for each player). I personally like the varied starting setup, but it would be simple to emulate the starting setup of the original game if desired. And lets face it – this version is gorgeous and has generally been very well received – a real win for a publisher just joining the family board game market. An addition to this release is the ‘Mordred Variant’, intended for seasoned players to add an extra level of difficulty. I’m yet to try it, as I feel the base game is (spoiler alert…) close to perfect – but at the same time, it’s nice to know its there! In terms of player numbers, the game plays very differently at all counts (two is a straightforward knife fight, three more subtle and with four you play in teams) – and there is divided opinion on which works best. Some will go as far to say they love it at one count and won’t play it at the others, for example. Personally I’m keen on the three-player game, but will play with any number. The King is Dead manages to pack a huge amount of depth into a small package while being beautifully designed and presented. Personally I think its a mechanical masterpiece and, along with Ingenious and Rosenkonig (being reprinted this year in English as The Rose King – hurrah! ), is one of my very favourite abstract games. However it bares repeating that this is as abstract as abstract games get which – combined with the low scoring count, big brain burning moments and myriad tie-breakers – means it certainly isn’t going to be everyone. On the plus side, if you want to try it out, the original King of Siam is available to play for free online at Yucata. * I would like to thank Osprey Games for providing a copy of the game for review.